I submitted The Lazarus Succession for a free review on Reader's Favorite, and as any author, I waited with some trepidation, in case it was picked by a reviewer with high standards. Finally, it arrived, and once again, I'm happy that I'm a writer. She wanted to give it 6 stars! While Lazarus has been a #1 Religious Mystery bestseller on Amazon UK since July of 2017, along with my other book, The Patmos Enigma, knowing what a reader thinks about the book is still a much needed validation. 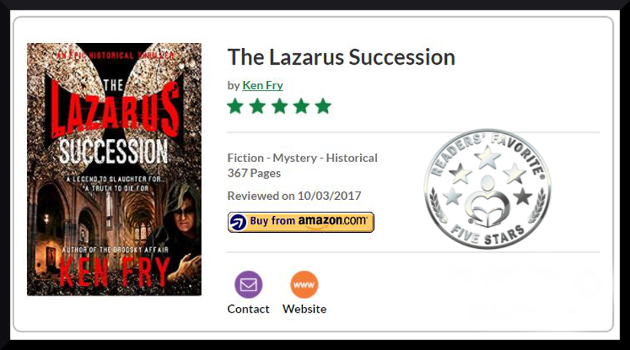 Readers' Favorite announces the review of the Fiction - Mystery - Historical book "The Lazarus Succession" by Ken Fry, currently available at http://www.amazon.com/gp/product/B01N68HZWT. 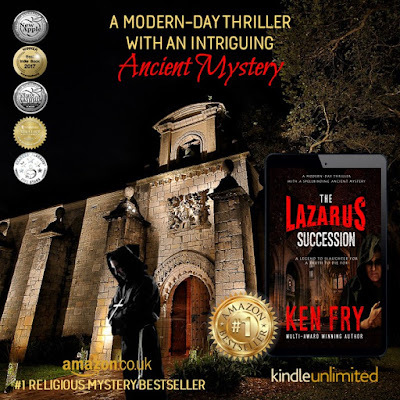 The Lazarus Succession by Ken Fry begins like many other books with the engagement of a rather suspect pair of heroes employed to find a missing medieval painting depicting Christ with Lazarus. It is said to have spiritual powers of healing. But this is where the similarity to so many others diverges. The story then leaps back in time to meet the painter Francisco whose family has ties to a secret organisation similar to the Knights Templar. As the story progresses, beautifully woven in both the present and the past, the complete chronicle comes to light and the well-chosen title becomes crystal clear. The villain, who has no redeeming qualities whatsoever, is an ex-judge who hires Brodie Ladro and Ulla Stuart to find the missing painting, with every intention of disposing of them as soon as the commission is complete. Add into the mix an aging and terminally ill Spanish Condesa, whose lineage stretches back to the days of the early Kings of Castille, and a forger the villain hires on his release from prison and you know you are in for a great story. I thoroughly enjoyed The Lazarus Succession by Ken Fry. The pace was just right, the characters believable despite the mysticism towards the end of the book, and the excitement continued throughout. Brodie and Ulla are not superheroes, although much smarter than average. However, Ulla does not hesitate to shoot when she has the chance. Set mostly in Spain, the book describes the landscape beautifully, along with the history of its religious orders and treasures. Although similar in many ways to the books by Dan Brown, I enjoyed it more. It was both sophisticated yet down to earth, despite Brodie’s visions. At no point does the author over dramatize the story, but with his excellent grasp of the written word he leads us to accept the surreal as perfectly normal and possible. The writing is excellent, the book is a treasure in itself and I would love to award this six stars. Listen FREE with your Audible Trial. Cancel Anytime!